Nowadays, every business is striving to gain a top position on SERP (search engine result pages). For this purpose, they use several methods both paid and unpaid. This process is known as Search Marketing. Search Marketing can be defined as the process of making paid and unpaid efforts to direct traffic and to gain visibility on search engine results pages. The concept of paid and unpaid efforts divides Search Marketing into two segments. The concept of Search Engine Optimization can be defined as the technique or strategies to attract traffic to particular website or blog. It is simply structuring your website in such a way that the search engines could easily recognize you. There are two ways to perform search engine optimization. On page SEO is a way of optimizing an individual website to increase its ranking on search engines and bring in relevant traffic. In On page SEO, the HTML source and the content on the website both are optimized. It is applied to those websites that are ranking on the first 3 or maximum 5 pages of search. No customer would like to visit a website that is ranked after 5 pages of search engine. The effort to bring your website from 6th or onwards position to 5th or less position is known as on page SEO. Optimizing a live page that is already ranking on the search engine is done via on page SEO. The activities that are commenced outside the premises of the website is known as Off page SEO. It other words, Off page SEO is to use certain techniques or strategies to direct traffic to a particular blog or website other than on page SEO. With the help of off-page SEO, the visibility of the website can be improved on SERP (Search engine result page). There are many people that relate Off-page SEO with link building but it is so much beyond that. If you leave a message or comment on another blog or post, you are doing off page SEO. Link building is still regarded essential for Google. If there is no link, Google will not be able to point your website. Top priority should be given to link building because it prepares your site SEO process. Sites used for questions and answer: These sites seek answers from common people about particular queries raised by audience of a website. The common question answer websites are Yahoo answers, Wiki answers or Quora. In these websites, if a user searches the answer of a particular question, number of answers show up as results. In the end of each answer, you will see the website link of the answer writer. This is off page SEO technique in which the person is driving the traffic to his website through question-answer site. Bookmarking sites: it a platform where several people promote their websites. High traffic is gained by bookmarking your website, blog. You can also post any content on the website. Anyone performing a search related our content topic will be directed to your website or blog. Below are the top bookmarking sites. Guest blogging: This is type of blogging which is done on the behalf of a third person which means you do not own the blog. It is a unique of bringing in traffic to a particular blog. Websites like Yourstory.com allows you to write a blog or story and post it and have you anchor your keyword like “Online Shopping”. This will increase brand awareness and direct traffic towards your brand website. In this section, we discussed the way of doing organic SEO or search. Now we shall discuss the paid method known as Search Engine Marketing. SEM is a paid process of directing traffic towards your blog or website. In this method. A famous tool is used in SEM known as Google AdWords. This tool allows business to display their business on Google by paying a certain amount of money. The SEM process works primarily on the concept of PPC (Pay Per Click). The user is directed to the website when he clicks the link mentioned as Ad on a google search. It is estimated that it takes about 6 months to one year to be ranked on the first page of search engine results. But to cut the time short, Google AdWords a solution by paying a certain amount to Google and get your page listed on top results. So These are the Traditional seo methods to rank your website and get inquiry but the Things are little bit different, Call me on 8401326950 and email me at rharendra@gmail.com for your websites free SEO audit and analysis. Successfully marketing your business online tends to be easier said than done. There are countless techniques and strategies out there, some of which can actually hurt your business in your long run. And to top it all off, Google’s algorithm updates are always changing how we approach search engine optimization. Fortunately, there are proven steps that you can take to improve your approach to online marketing, and here are ten of them. Updating your blog is one way to accomplish this, but there are many others. Today’s web users realize that they have plenty of options. In order to separate your business from the herd, you must prove that you are an authority in your field. First and foremost, you must offer knowledgeable customer support. If a customer or client calls or emails your company with a question, you had better be able to provide an answer. Make an effort to educate your audience. This will get them excited about what you’re doing and empower them to make a confident purchase. There was a time when using the same keywords over and over could boost your SERP ranking, but those days are long gone. Google has ways of knowing if your content is actually benefiting the end user. It looks at factors like the number of organic clicks, the bounce rate (how many people are visiting your site and then just clicking the “Back” button? ), the amount of time spent on each page. You better give your visitors a reason to stick around, because if they’re not finding what they’re looking for, you won’t maintain your search engine rankings for very long. Too many businesses focus on their website and email list, forgetting how much free marketing opportunity is available on social networking sites. On the other side of the coin, too many businesses use social media poorly, damaging their reputation in the process. Share relevant content regularly, but don’t overdo it. Interact with your audience, but don’t be invasive. Your personal approach to social media may not be ideal for your company, so consider hiring a social media consultant if you’re not confident in your approach. If your website doesn’t work flawlessly on mobile devices, you are going to have serious problems. According to Search Engine Land, Google has confirmed that more users search from their mobile phones than from their desktop computers. In today’s competitive market, one minor detail can send your audience elsewhere. After all, why would someone bother using your laggy, error-ridden page if there is a pristine website offering similar products or services? While there’s nothing wrong with shooting for the stars, it’s important to be realistic. As you optimize your website, focus on your company’s role. For example, if you own a local burger joint in Seattle, you probably don’t want to optimize your website for keywords like “fast food burgers,” as the competition is massive. However, “Seattle grass-fed burgers” narrows it down a whole lot. Don’t miss the forest for the trees. Embrace your local roots and expand when it makes sense. Nobody wants to sift through a wall of text. The right image or video can be just as informative and much more pleasing to the eye. These days, a website with high-quality videos and images is not a treat – it is the norm. Your website can offer the best exclusive content in the world, but if it doesn’t look pretty, you’re not going to retain an audience. There are plenty of royalty-free options out there, but creating your own content (or hiring someone to do it for you) really takes your brand to the next level. Nobody likes spam. If your company is constantly sending out promotional emails or updating your Facebook every five minutes, your customers are going to respond negatively. While you do want to remind your audience that you exist, there are few things worse for business than an overbearing online marketing campaign. It can be tempting to take advantage of free advertising programs, but how you do it matters much more than how often you do it. You can write a novel about how your company is the best in the business, and nobody will care (even if it’s true). Why? Because you have something to lose. You have a very obvious motivation for talking a big game. When you get an awesome Yelp review or a nice email, you are getting some of the best promotion possible. Share (with permission) any kind words that your customers and clients have to say. Today’s savvy web users would rather hear praises (or scorn) from someone with real, first-hand experience. A qualified online marketing agency can do wonders for your online presence. If online marketing isn’t your area of expertise, call a reputable SEO firm or SEO Consultant. It’s abundantly clear that the future of business is going to take place on the Internet, and now is the time to make sure that your roots are firmly planted. Too many businesses assume that online marketing is a layman’s job, and that simply isn’t true. If you don’t have professional experience in online marketing, talk to someone who does. The future of your organization could depend on it. Carolyn Clarke is a freelance writer and SEO specialist who has contributed to a number of online publications. She currently lives in Salem, MA with her husband, son, and puppy. Besides her love for anything computer-related, Carolyn enjoys yoga, modern dance, and watercolor painting. Can Your Clients Afford SEO Services in 2015? Time is of the essence when it comes to online marketing. Pulling a wrong move might cost you customers and money. Imagine you have a site that is too complex for consumers to understand but your rival has a better one that is simple to navigate. This will drastically reduce your chances of having a substantial number of customers on your site vis-a-vis your competitor. Worry no more, you can check out strategies described below from experts in the field. Seemingly, most of the traffic in online sites usually comes from phones. The use of responsive design is necessary for portable devices to view the content in a manner that is appealing to them. Double standards should be applied to first time visitors to the site as compared to people who frequent the web page. This is referred to as knowing your customer journey and helps to guide customers where they find difficulties. Properly organized sites are mostly preferred by customers since they enable them to maneuver in and out of the web page without a hustle. This should be enhanced. This is the single most important aspect of including relevant content in web pages. Marketers should make searches for keywords that are mostly used by customers. Avoid borrowing information from other sites and including them on yours as is. This is outright plagiarism and serves no purpose to inform customers on the latest news. The best way to sell your product is by showing customers how to use them. With this in mind, they will always use your product since they know how it works. Give every detail about it and be as frank as possible, not leaving out the shortcomings of the product. Your story should be relevant to consumers for years to come, if you want to maintain them. Blog sites help discuss products in detail and this should be encouraged in the creation of content marketing. In addition, review sites should be created to allow customers give their take on the products and services rendered to them. Aspects such as size of images and other features on the interface should be taken in consideration. Be as brief as possible and straight to the point when delivering the content. Making it possible for customers to share the content on social media is a must for a successful site. Finally, you need to patent your content, so that you get credit for what you created, even if it has been hijacked by someone else. Search engine optimization (SEO) used to be too technical only the site developers, webmasters and experts can configure and maintain it. Things have changed dramatically. What was effective in 2011 was not so effective in 2013 and already obsolete in 2014. There are new best practices and of course, rules. Here are some of the SEO do’s and don’ts applicable today. Embrace higher word counts. Articles that dive deep into the topic ranks seven times higher than shorter articles. Just make sure that the content is informative to the user otherwise it will defeat its purpose. Use relevant words and not necessarily exact word matches. Relevant terms bear more weight than exact words. Put keywords when there is an evident natural fit. Don’t force it. Check page load time. Page load speed is a requirement, not an advantage. There is nothing more annoying than a page that takes forever to load. Include backlinks. Backlinks help in building credibility. Nonetheless, source backlinks from credible sites. These are the sites with high authority and PageRank. Put the keywords in descriptions, headers and titles. This is another must. Consistency is key. A keyword that appears on the page should also be found (as much as possible) in the URL, page title, headline, title, sub-title and meta description. Regard natural phrases as keywords. When utilizing keywords though, use only the highly targeted ones. Write like a real person interacting with another real being. Use your real name (in author bio). Satisfy the users, not the bots or spiders. Think UX (user experience). Create engaging and enjoyable contents that are created with the users in mind. Forget jargons and other industry and technical terms. Use easy-to-understand words instead. Speak the language of the users, if you must. Write in short, easily digestible sentences. Remember: contents are consumed on-the-go. Publish 100% unique, high-quality and informative contents. Offer fresh perspective to whoever will be reading or viewing the articles, for instance. Adhere to Google’s quality guidelines. This is the backbone of doing SEO in 2014 and beyond. Create and verify the account on Google+ pages for business. Again, make sure that the business information are consistent. The process also breeds trustworthiness. Establish a good reputation. Get customer reviews especially from industry-specific sites. Focus on social sharing since it boosts search results. Be where your users are. Facebook is for B2B and B2C while LinkedIn is for B2C, for example. Interact with community members. Contribute to various discussions. Cram lots of keywords into contents. Skimp on visuals such as photos, images and videos. Try ‘shortcuts’ or anything that will game the system. Majority of the items tend to be very basic, and have long been included in the list of SEO do’s and don’ts. In positioning your website and thus your business for long-term growth, invest more time and effort in doing the do’s while discarding the don’ts. If you do this, expect results in no time. One thing we collect for our semiannual ranking factors survey is the opinions of a group of SEO experts (128 of them this year!) about the relative weights of the categories of ranking factors. 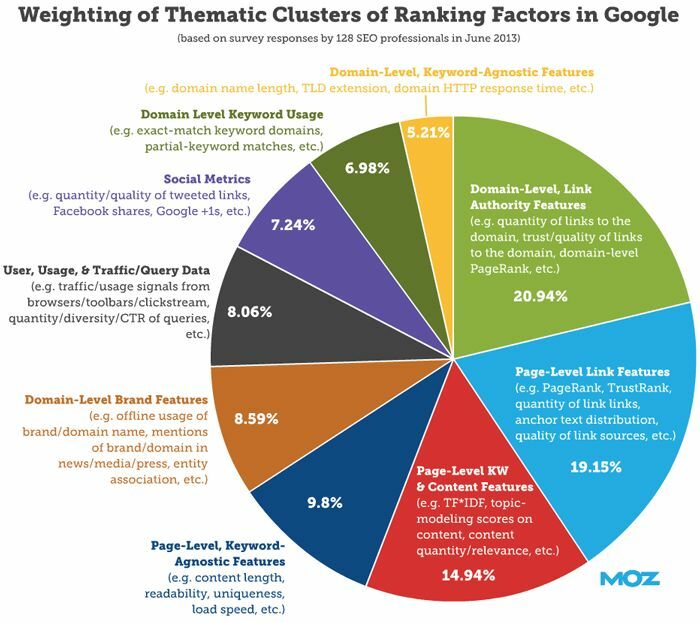 In other words, how important each of those categories is for SEO relative to the others. In today’s Whiteboard Friday, Rand explains some key takeaways from the results of that particular survey question. In addition, the pie chart below shows what the categories are and just where each of them ended up. A few weeks ago, Facebook announced that video is now available on Instagram. We were pumped … and then quickly disappointed because we couldn’t do anything besides post videos to Instagram. No embedding options whatsoever, and hacking the video embed code was fairly complex and didn’t always work properly. While Instagram photos have never had the embedding option either, you could easily make up for it with a little HTML know-how. With a little bit of hacking, you could make Instagram photos appear on your blog … but it wasn’t the easiest process possible.